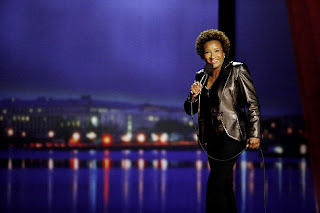 Fourth Row Center: Film Writings by Jason Bailey: On DVD: "Wanda Sykes: I'ma Be Me"
Wanda Sykes: I'ma Be Me is the funniest stand-up special in many a moon, an uproariously enjoyable performance by one of our most gifted and irreverent comediennes. In this, her third full-length special, Sykes is in full command of her craft--biting, timely, smart, and very, very funny. The special, originally aired on HBO, was shot in Washington D.C., which Sykes acknowledges early in the show; "You know, the last time I was here, I caused a little trouble," she notes with a grin, referring to her semi-notorious gig at Obama's first White House Correspondents' Dinner. From there she springboards into laugh-out-loud material about the new president ("How does he stay so cool? Is he still smokin' weed?"). She defends Michelle and floats some theories about their marriage (her thoughts on their level of intimacy are completely inappropriate--and crazy funny). She touches on the problems he's battled thus far: education, health care... and pirates ("I'll bet Barack thought Rahm Emmanuel was punkin' him when he told him about that"). Most intriguingly, she delves into some insightful (if absurd) material about what the Obama presidency has done to racial identity and imagery in America. There's other political material as well; she talks about immigration (noting that given the choice, "there's a few Americans I would like to trade out! "), the confirmation of Judge Sotomayor, and, most significantly, the passage of Prop 8. The material that follows is the most significantly different from her previous specials, since, in the three years since Wanda Sykes: Sick and Tired, she met and married her partner Alex and came out as a lesbian (primarily, she said, as a response to Prop 8). She eases the audience in to the material about her sexuality, with only a fleeting joke a third of the way in (when talking about death and cremation, her response to where she'd want her ashes spread: "over Halle Berry"), followed by a couple of casual mentions of "my wife." Once she opens up about coming out, she does so with some very strong material, particularly an extended bit imagining what it would be like to "come out as black." Her discussions of gay issues could easily have veered into the kind of sketchy didacticism that frequently invades Margaret Cho's act. But she never lets the commentary take over the bits; she keeps the jokes coming fast enough that it doesn't feel like we're being preached to. In some ways, though, the writing is secondary; even when the material is spottier (as when she talks about her new kids), she's such a naturally funny presence that you laugh anyway. Her years of working with Chris Rock are more evident than ever--she's got the same kind of bigger-than-life onstage personality, manifested in her take-no-prisoners confidence and fiery cadences. Her strangulated vocal delivery remains her greatest comic weapon, with her skillful use of profanity a close second; meanwhile, her descriptions of her fights with "Eshter" (the nickname she's given to her tummy roll--get it, Esther Rolle?) is legitimately reminiscent of Richard Pryor's dynamite bits about the battles within his own body. Her overall physicality is particularly striking in this special--she uses her entire body to score huge laughs, whether imitating Obama's walk (both before and after election), enacting a Babies-R-Us prank with her family, or doing an uproarious reenactment of how she got a charley horse when trying to exercise her kegel muscles. In those moments particularly, she can't help but laugh at her own silliness; she's clearly having a great time, and her enthusiasm is infectious. Wanda Sykes: I'ma Be Me is perhaps a bit overlong at 86 minutes; Wanda runs out of steam a bit towards the end (though her riff on Jamie Lee Curtis' yogurt commercials is an absolute scream). Her delivery is strong and her timing is outstanding, and though her latest special starts stronger than it finishes, it's still awfully funny stuff.